Ovo Energy has debuted its biggest-ever ad campaign as a provocative challenge to climate change deniers, in the first work released by start-up agency collective Uncommon. Ovo was Uncommon’s first major client win after the independent energy supplier split with The Brooklyn Brothers in December. This campaign marks the much-anticipated debut effort by the creative company founded by former Grey London executives Lucy Jameson, Nils Leonard and Natalie Graeme. At the centre of the "Power your life differently" campaign is a one-minute film featuring household appliances that are plugged into the earth as a metaphor for renewable energy’s potential to power the world. Televisions on a beach broadcast climate change deniers, who are rebutted by the iconic call-to-arms "Get mad" speech from the 1976 film Network. Set to the track Raining Blood by thrash metal band Slayer, the spot acts as a rallying cry for people to switch to renewable energy. The ad was directed by Andreas Nilsson through Biscuit Filmworks. It will air on TV channels including ITV and Channel 4 during programmes such as Homeland, Marcella and Endeavour. The Specialist Works and Periscopix were the media agencies. 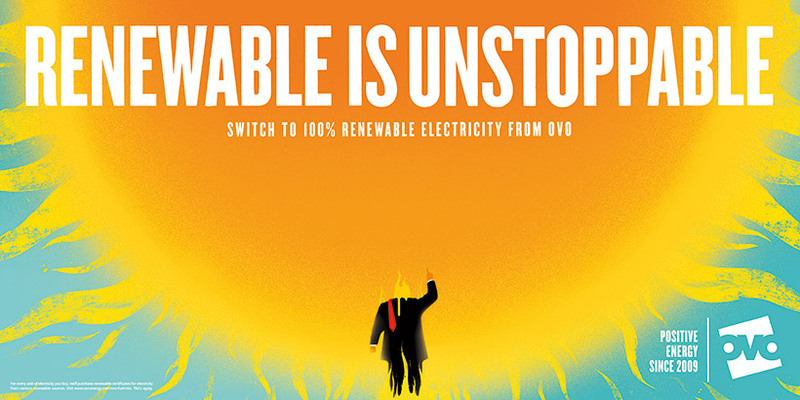 Running until mid-April, the campaign also includes digital, social, press and outdoor ads that juxtapose protestations by climate change deniers with bold illustrations of renewable energy sources. One image shows a figure meant to resemble US president Donald Trump facing a large sun. Rather than demanding that people use less energy, the creative aims to motivate people to join Ovo in building a sustainable energy system. Sarah Keegan, the brand director at Ovo Energy, said the campaign is the beginning of the company "empowering our customers to power their lives differently." "The more we come together, the bigger change we’ll see in powering our lives without ruining the planet," she added. Uncommon is the fourth creative agency appointment that Ovo has made in as many years. Before Brooklyn Brothers the challenger energy brand, which has 850,000 customers in the UK, appointed Wieden & Kennedy London but that relationship did not result in any work. Nils Leonard, founder and chief creative officer of Uncommon, said of the campaign: "Being environmentally conscious isn’t fringe anymore. Being conscious is the smart choice, and one we can make in every moment of our lives; we wanted everyone who sees the ads to recognise they have the power to make a change. "The creative treatment is provocative and the metal soundtrack sets the tone for a commanding and unconventional film from a company in the energy sector." Graeme, Leonard and Jameson officially launched Uncommon in September after their high-profile departure from Grey London in 2016. The agency’s model is to have a core team of staff while building bespoke teams of strategists and creatives for each project. Was Uncommon worth the wait?